Occupy London activists have criticized police for grouping anti-capitalist protesters together with Al-Qaeda and the Irish Republican Army (IRA) as ‘extremists’ in a slideshow presentation on potential threats to London. The presentation was given to nursery and primary school staff as part of an initiative dubbed Project Fawn, in which City of London police prepare schools for potential terrorist attacks on the UK. In the slideshow, which was acquired by the Guardian following a Freedom of Information request, Occupy London is listed as an example of “domestic extremism” along with student and climate change protests. Speaking to RT, Occupy London activists said the revelations show how serious a threat the demonstrations posed to the capitalist system. The presentation covers threats to the UK by Islamic State (IS, formerly ISIS/ISIL), Al-Qaeda, lone gunmen and IRA terrorists and offers advice on dealing with bomb threats, hostile reconnaissance and screening mail. It is also looks at left wing and right wing groups under the heading of domestic extremism. Left-wing groups considered to be extremist include the Stop Huntingdon Animal Cruelty group, climate change protesters, student demonstrators and Occupy London. One slide titled ‘History in City of Terrorism and Domestic Issues’, features an image of the 2011-2012 Occupy London protests alongside photos of the 1997 Provisional IRA bombing of London’s docklands and the 7/7 bombings in 2005. Matthew Varnham, director of human rights organization Legal Observers, told RT the sheer cost of policing recent democratic protests suggests the authorities continue to treat legitimate dissent as a serious threat. The Metropolitan Police spent £1.9 million (US$2.96 million) policing demonstrations outside Parliament from mid-October 2014 to mid-February 2015, according to figures retrieved by London Assembly Member Baroness Jenny Jones. “Based on the basic officer salary being at £19,386 working 233 days per year this means, per day, policing the square could have paid for 1,354 police officers,” Varnham said. At the height of the global Occupy protests in December 2011 the City of London police included a detailed account of Occupy London activists on a ‘Terrorism/extremism update’ sent out to ‘trusted partners’ in the area. One document, dated December 2, encourages the business community to report suspicious behavior to the police. “As the worldwide Occupy movement shows no sign of abating, it is likely that activists aspire to identify other locations to occupy, especially those they identify with capitalism,” it states. 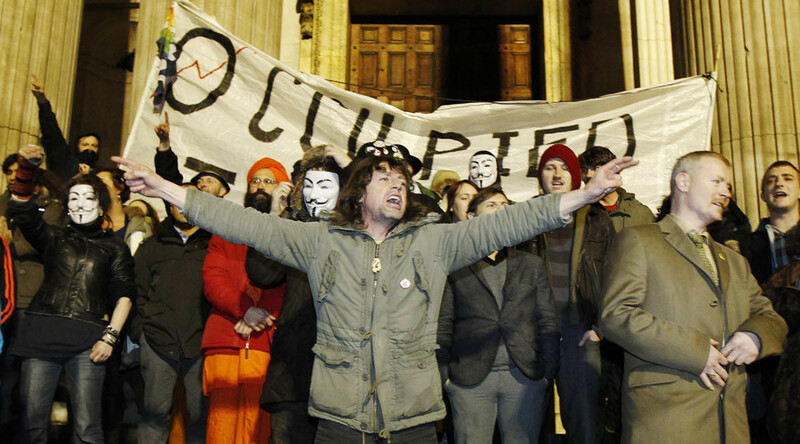 After the documents were leaked to the press, City of London police apologized to a member of Occupy London. “To reiterate, it was never our intention to suggest that we view the Occupy Movement as being terrorist or extremist in nature,” Staff Officer to the Commissioner Darren Pulman said in the email. Pulman provided a link to an apology which was posted on the police force’s website. The link is no longer working and the page appears to have been taken down.